It is a typical Portuguese communal flag, with the coat of arms centred on a field quartered of black and white. Shield Argent, a castle Sable masoned Or with port and windows Argent, in front of the main entrance a horse salient Sable mounted by a knight in clad armour, also Sable, in base a ship Sable lined Or with two ravens respectant Sable, one upon prow and one upon stern, in chief a 6-point-star Azure at dexter and a crescent recumbent inverted ules at sinister. 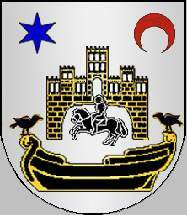 Mural crown Argent with four visible towers (town rank) and white scroll with inscription in black initials "S. VICENTE DA BEIRA". The ship with ravens is alluding to St. Vincent, name giver of the commune and probably also local patron saint. These charges can also be found in the arms of Lisboa. São Vicente da Beira Commune is one of the 19 communes of Castelo Branco Municipality; it had 1259 inhabitants in 2011 and covers 100.6 km².